When Western explorers first encountered dolmens in the Levant, they thought they had discovered the origins of a megalithic phenomenon that spread as far as the Atlantic coast. Although European dolmens are now considered an unrelated tradition, many researchers continue to approach dolmens in the Levant as part of a trans-regional phenomenon that spanned the Taurus mountains to the Arabian peninsula. 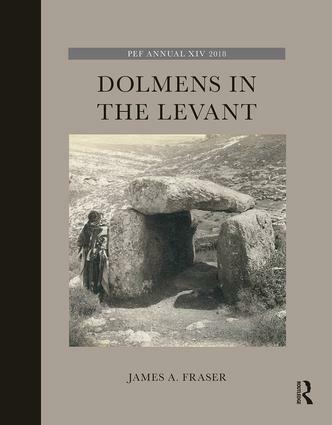 Dolmens in the Levant is essential for anyone interested in the rise of civilisations in the ancient Middle East, and particularly those who have wondered at the origins of these enigmatic burial monuments that dominate the landscape. James A. Fraser was awarded his PhD at the University of Sydney, Australia, for his thesis on Levantine dolmens in 2016. He served as Project Curator for the Ancient Levant at the British Museum 2015–2017, and is now Senior Curator of the Nicholson Museum, University of Sydney. He has worked on archaeological projects in Jordan, Syria, Iraq, Afghanistan, Uzbekistan, Kashmir, Greece, Cambodia, Australia and the Solomon Islands. He currently directs the Khirbet Ghozlan Excavation Project, investigating the production of olive oil in Jordan around 2000 BCE.